To advance their message, social conservatives should protect the First Amendment and free markets. Sitting in a new Chick-fil-A in beyond-blue California and watching the crowds of families pile in, it occurs to me that they’re sending an ardently family-friendly message. This Chick Fil-A opened right next door to a Hooters on the town’s main boulevard. Because it’s opening weekend, the restaurant is populated with employees whose southern drawls and friendliness make it clear they are from corporate, not Los Angeles. They charm everyone in the place, however, and something happens in the restaurant that almost never happens in California: Strangers smile and even chat to one another about their kids. The friendly attitude appears contagious. As each group of kids and parents piles in, it becomes quickly obvious the restaurant’s clear priority is being kid-friendly. Moms and dads bring their kids here whether those parents are married or not. Maybe there’s a lesson here for how best to project policy that reflects your social values without shutting out people who have been unsuccessful at sustaining a marriage. While I ardently believe what research also shows, that kids do best with a married mom and dad, I recognize this will not always match reality. So how does one connect with a divorced person if your only message is, “You should not be divorced”? Braun, this particular store’s owner, said, “I wanted to show that Chick-fil-A doesn’t discriminate against anybody. We serve everyone. We’re happy to serve the community, and this was an opportunity to have this group come in and show them our hospitality regardless of their beliefs, sexual orientation, or whatever. Chick-fil-A has never been about hate.” Braun did not say he doesn’t support traditional marriage. He simply said he welcomes everyone. The protesting local LGBT community reacted positively. More “messaging” about family values was accomplished that day than I’ve seen most politicians pull off. The simple act of welcoming people without pretending that means sacrificing your beliefs works for normal folks. It may never appease the purposeful hysterics of the political fringe, but the fringe doesn’t want to be appeased. They can’t exist without outrage, therefore they have no interest in solving it. Attempts to prove them wrong do little to advance your case with the majority of the electorate. A conversation in a bubble may provide pithy sound bites, but most of America isn’t paying attention. Now, I’m not saying policy does not matter. I’m saying policy should be judged on a distinct set of criteria that leaves space for the community to align on values. Scott Lincicome developed a solid direction of inquiry here. My basic questions are always these: Does it get government out of the way to allow the free market to function? Can Americans freely engage in the public square to run businesses in accordance with their values? Does a particular policy work against families? To build a credible reputation with the American public, people cannot oppose one nanny state but support another their party oversees. While I wouldn’t normally quote Joy Reid, her retort lays bare such quasi-conservative arguments. [S]ome students complained that the meals weren’t filling, nor were they appetizing. Wallace County High School in Sharon Springs, Kan. created a video called ‘ which parodied Fun’s ‘We Are Young.’ Students are seen pretending to faint from hunger and sneaking snacks to school in order not to starve during the day. Other schools may have gone too far in lowering caloric content. The New York Times reported that New York City officials admitted that many of their meals were below the minimum calorie requirements, especially for older students. Some schools announced in Aug. 2013 that they were leaving the National School Lunch Program, which pays schools for the meals they serve and sells them lower-priced items. They said many kids were opting not to skip lunch because they didn’t like the healthier options, leading to greater financial losses among other negative downsides. Arguments like “No more bake sales. 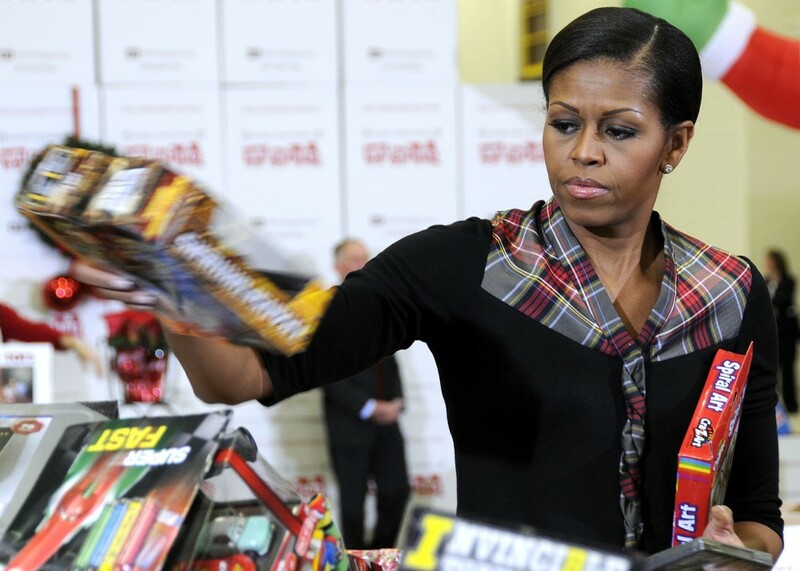 New Federal Rule could hurt school fundraisers” and “The kids are starving” made a difference. Not one normal person read this Government Accountability Office report and turned against Michelle Obama’s lunch diktats. They heard from their community that kids were hungry. Government-run schools turned down federal money because accompanying regulations were so unpopular. Just let that sink in. When things hurt children, people respond. While that can lead to reactionary policy (just watch politicians within hours of any newsworthy shooting tragedy), it is a worthy lens to use to promote positive policy. The culture wars appear often contentious, but some common ground should be apparent. Supporting families and a prosperous future protects children. The chain has the biggest sales per unit in fast-food, according to QSR Magazine. In 2011, the company generated gross sales of $2.9 million per location, outpacing the average unit sales of runner-up McDonald’s Corp. (MCD) by $400,000, the magazine said in its August 2012 issue. Chick-fil-A’s success shows a free market responds when you plan with kids in mind. Rather than merely preach their values, they live them. The company’s employees live their own story cheerfully. That’s a way better sales job than telling someone what to do. Family values are based on what’s best for children. It’s time to talk about them that way. Amy Otto’s work has also been published at Townhall, Pocket Full of Liberty, and the UK site The Conservative Woman. She has co-hosted The Wrap and Splintered Caucus, weekly podcasts that covered culture and politics. Follow her on Twitter, @AmyOtto8.